So I was digging through my back-stash of pictures trying to figure out what I wanted to share today when I came across these pictures from a few months ago. (I'm great when it comes to doing my nails and taking pictures - editing the pictures and writing the posts? Not so much.) Anyway, these are pictures from my first attempt at a blobicure - the process of painting a moderately thick base coat and then adding 'blobs' of other colours on top so they can spread out in the base polish and create neat organic looks. 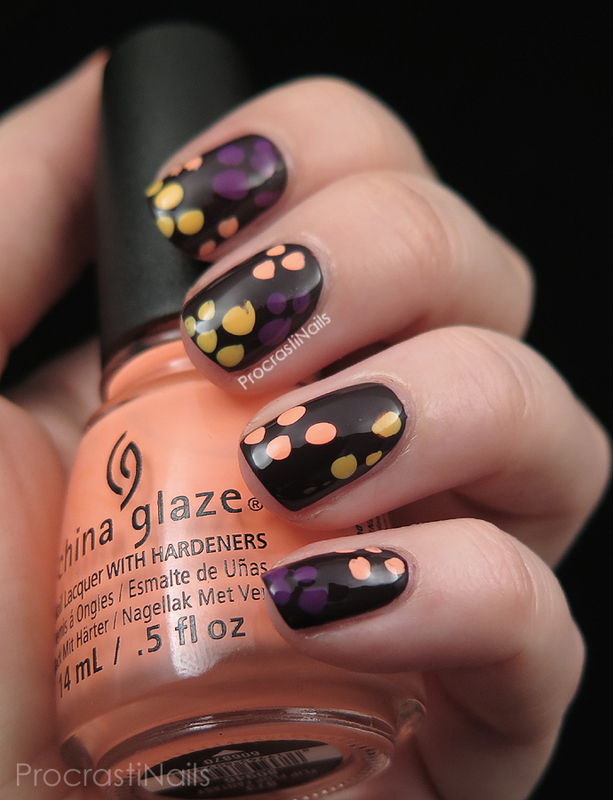 I decided to use entirely China Glaze polishes to play around with for this attempt. My base is What Are You A-Freight Of? with the blobs done in Givers Theme, Metro Pollen-Tin and Flip Flop Fantasy (the colour of which was completely sucked out in these pictures - boo). I think part of my problem was that I let my base coat dry too much before I tried blobbing on my other colours, and then I didn't make my blobs big enough. I think I was scared of the horrendously long time my mind was telling me it would take to dry if I did the technique properly! Have you ever tried a blobicure? How did it turn out? ALSO I want to express my annoyance at it being spelt "blobicure." Every time I write it I use two b's and write "blobbicure" - am I weird for wishing it was spelled that way? Argh! Haha. I think it came out lovely! 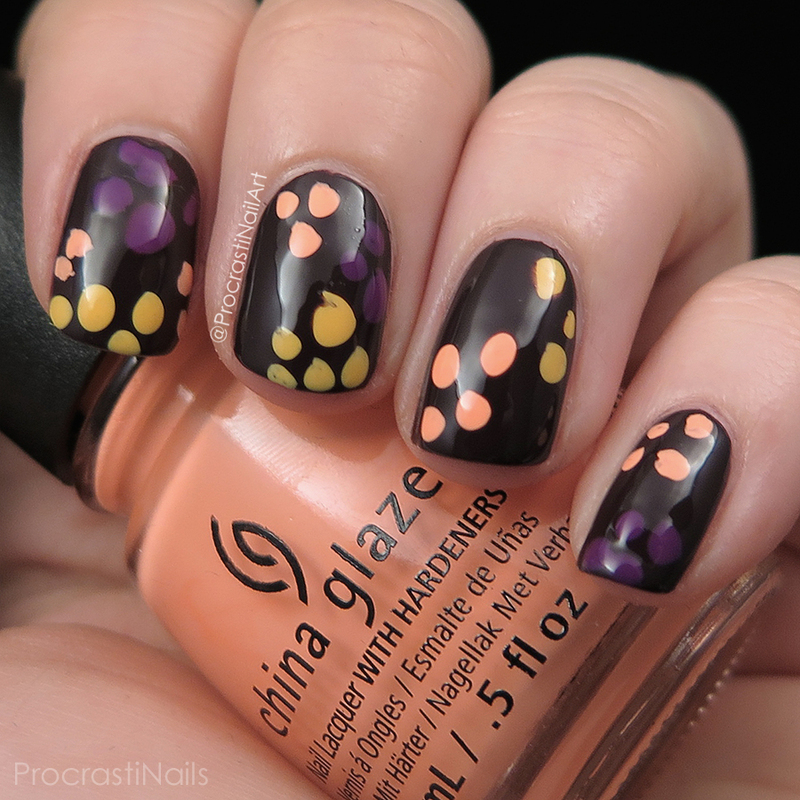 China Glaze does tend to dry quickly too, so using a polish that isn't such a quick dry might help too! I did a holo version of a giraffe, but I definitely want to try again. They're fun and simple! Oh that's good to know! I didn't even think about the differences in polish drying times. I'll have to take that into consideration next time! I don't think it was a fail! I think it looks pretty darn nifty. I like the colors in this! I think these look really cool! The color combination is really lovely! I also had a nail fail with my blobicure recently :( why are the 'simple' designs always the most difficult. Like it's just blobs and I can't even do that right lol. I know it's not the look that you were going for but I still like this. The colors really pop off that black base. I haven't attempted this look yet but I'm sure my results and feelings will be about the same as yours. I've been so interested in trying blobbicures myself and for this being your first try, I think it turned out really well!! We are always our worst critics and I can't wait to see what else you come up with when you try them again! I totally lol'd at Olympic results at Kindergarten level experience, story of my life! Ha! 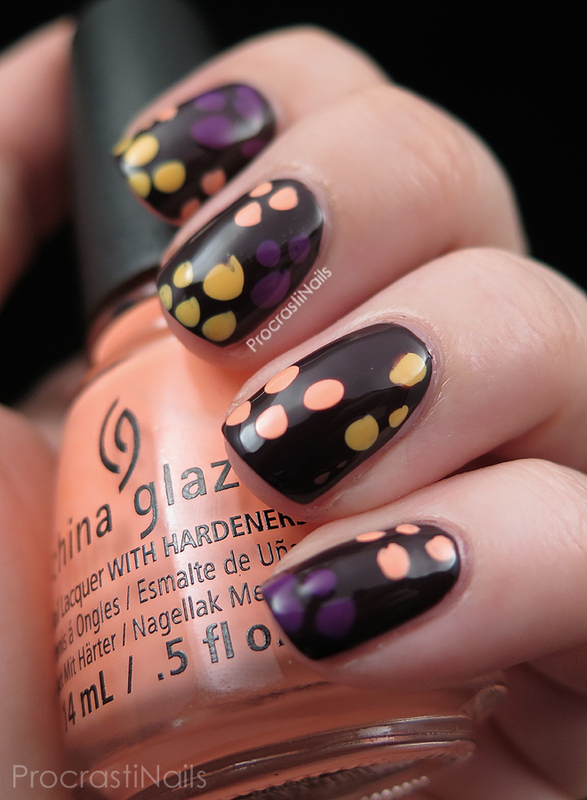 So cute, love the colors you used! I actually published my first blobbicure today, and I think it's indeed important to not let your basecolor dry. I did everything nail by nail, so paint my color, do the blobs, paint my color, do the blobs and so on. I didn't even know you could use different colours, go figure! I need to try this technique out, too! you are too hard on yourself. Tho it's no shape like turtles or anything, it's still pretty. I probably won't try this tho. I will just end up nicking the manicure here and there before it's dried and then I will scream and curse at everything. It's a very cool nail art! I have never tried blobbicure yet, but it seems so simple that i think to try this week end! I'm not sure I want to try a blobicure (which by the rules of grammar should totally be blobBicure)--I have the same concerns about dry time!